August 2002: Iranian exiles say that Tehran has built a vast uranium enrichment plant at Natanz and a heavy water plant at Arak without informing the United Nations. September 2002: Construction work begins on Iran's first nuclear reactor at the Bushehr power plant. December 2002: The existence of sites at Natanz and Arak is confirmed by satellite photographs shown on US television. The US accuses Tehran of "across-the-board pursuit of weapons of mass destruction". Iran agrees to inspections by the International Atomic Energy Authority (IAEA). February 2003: Iranian President Mohammed Khatami reveals that Iran has unearthed uranium deposits and announces plans to develop a nuclear fuel cycle. IAEA chief Mohammed ElBaradei travels to Iran with a team of inspectors to begin probing Tehran's nuclear plans. June 2003: Mr ElBaradei accuses Iran of not revealing the extent of its nuclear work, and urges leaders to sign up for more intrusive inspections. August 2003: Traces of highly enriched weapons-grade uranium found at Natanz. September 2003: More enriched uranium discovered, prompting urgent calls for Iran to sign a voluntary protocol formalising a tougher inspection regime. October 2003: After meeting French, German and UK foreign ministers, Tehran agrees to stop producing enriched uranium and formally decides to sign the Additional Protocol. No evidence is produced to confirm the end of enrichment. November 2003: Mr ElBaradei says there is "no evidence" that Iran is pursuing nuclear weapons. The US disagrees. December 2003: Iran signs the protocol at the IAEA headquarters in Vienna. February 2004: Abdul Qadeer Khan, the godfather of Pakistan's nuclear bomb, is reported to have sold Iran nuclear weapons technology. February 2004: IAEA report says Iran experimented with polonium-210, which can be used to trigger the chain reaction in a nuclear bomb. Iran did not explain the experiments. Iran again agrees to suspend enrichment, but again does not. 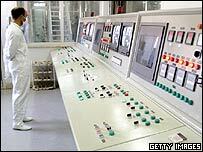 March 2004: Iran urged to reveal its entire nuclear programme to the IAEA by 1 June 2004. June 2004: Tehran is criticised by the IAEA for trying to import magnets for centrifuges and for not offering "full, timely and pro-active" co-operation with inspectors. 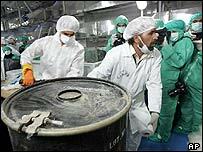 September 2004: IAEA orders Iran to stop preparations for a large-scale uranium enrichment. US Secretary of State Colin Powell labels Iran a growing danger and calls for the UN Security Council to impose sanctions. Iran says it has resumed large-scale conversion of uranium ore into gas. November 2004: Iran agrees to halt all enrichment activities during talks with the three European Union states, but pledges to resume in the future. January 2005: IAEA inspectors allowed into the secretive Parchin plant near Tehran. April 2005: Iran announces plans to resume uranium conversion at Isfahan. May 2005: EU states warn that any resumption of conversion would end negotiations linked to trade and economic issues. Iran agrees to wait for detailed proposals from the Europeans at the end of July. August 2005: Hardliner Mahmoud Ahmadinejad is installed as Iranian president, as Tehran pledges an "irreversible" resumption of enrichment. Iran rejects the latest European proposals for resolving the nuclear crisis. Iran appoints a hardline politician, Ali Larijani, to lead the country's nuclear talks with the European Union. Iran resumes sensitive fuel cycle work at its uranium conversion facility near the city of Isfahan. An independent investigation finds no evidence that Iran was working on a secret nuclear weapons programme. It concludes that traces of bomb-grade uranium in Iran's nuclear facilities came from contaminated Pakistani equipment, not Iranian activities. The US dismisses the report. September 2005: A study by the International Institute for Strategic Studies concludes that Iran is still several years away from acquiring a nuclear weapons capability. Speaking before the UN General Assembly, Iranian President Mahmoud Ahmadinejad says his country has an "inalienable right" to produce nuclear fuel. The IAEA passes a resolution setting Iran up for referral to the UN Security Council at a later date, on the grounds of Tehran's non-compliance with international nuclear safeguards.